I know many of my fellow geeks have done video game themed artwork, so I thought I’d let you know about this Video Game art exhibit that’s coming up at Altered Esthetics. Visit Ae’s open calls page to see if there are any other shows you can submit work to. And don’t forget to put Suit Up! on your calendar–third Wednesday of every month. Artists of all skill levels are welcome to draw or to model in costume! This is the Election Year, the time when politicians are becoming wild and ready to kill for a couple of votes. This is the time when normal people (like cartoonists) should stop the villains and show their tricks to the public. 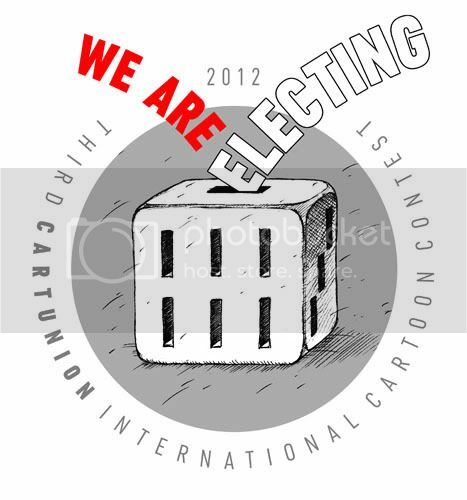 This is actually the goal of the “We are electing” Cartoon Contest organized by the International Cartoonists’ Club CARTUNION. I should probably mention that the Diplomas are the original drawings by the great artists (I wish I could get one). Also, there is a nice cartoon album waiting on my bookshelf only for Conspirators. We hope that you will be able to participate in the show. Saint Paul Cartoonist Conspiracy Jam on January 19!! 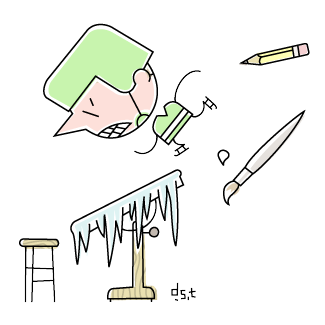 Just to let you know, I am going to be starting to post Guest strips/pin-ups starting this Friday, January 20. You can still get in on the action! If you need a little more time than today (January 15), that’s just fine! I have seen the submissions so far, and I am blown away by how awesome they look, and I’m really excited to put them up on my website for everyone to see! If you’d like to get in on the action, send your submission to jsloan28@hotmail.com I will accept JPEG files. Along with the submission, write down a few words regarding your previous and current projects so that I can plug your work. EXTENDED DEADLINE : January 31st. 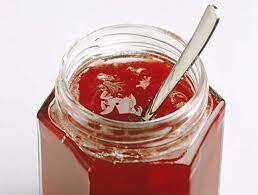 Thanks, and hope to see all of you at the jams! 7000 BC is pleased to return to the Albuquerque Comic Con, at its new location at the Hard Rock Hotel & Casino Albuquerque. Buy your tickets and find us in Artist Alley with the latest from the group — including some brand-new releases from the group, and our just-printed Jams anthologies! Mpls. Sat. Open Studio, Jan. 14, noon to 4 p.m. The whole metro area is buzzing about the Red Bull Crashed Ice Ultimate Ice-Cross Downhill Racing Event to be held from 7 to 9 p.m. on Saturday, January 14 at the St Paul Cathedral. * And you can go to that for sure. If you want to experience extreme thrills, that is. But before you go there, stop by the Saturday Open Studio and do some drawing and socializing. You’ll get out in plenty of time to make it to the 7 p.m. start of the exciting Red Bull Crashed Ice whatchamacallit. Join your fellow cartoonists at Minnesota Center for Book Arts. We’ll be at the high tables, just a little past the store. There’s a coffee shop in the building for sandwiches, snacks and beverages. Plus free, sorta slow (but free!) coffee-shop wi-fi. *Actually, the whole metro area is buzzing about Downton Abbey or Portlandia or maybe the area is buzzing about climate change. Frankly, I can’t keep up with of all the things the area is buzzing about. If you would like to do a guest strip, please send your submission to me at jsloan28@hotmail.com. I would like to get jpegs, a rough size guideline is that many of my strips are roughly 8.5 inches by 11 inches. Along with your submission, I would like you to send a small writeup of your work so I can plug your site and other projects you have been working on. I would like to get these on or after Jan. 15. I am just looking for others to do a strip with my characters that doesn’t have to tie in with any of my regular story lines. It can be just a pin-up if you’d like. Just a small word on content…my stuff is generally regarded as “G” to “PG” rated, so if you could please work within that framework, it would be greatly appreciated! If you have any questions, please reach me at the above email address. Thanks to whomever can submit a strip. Again, hope 2012 is treating you all very well! FEB. 2: Nick Straight & Kevin Cannon, “InDesign Boot Camp” – ID basics with an emphasis on making print-ready comics and exporting pdfs. 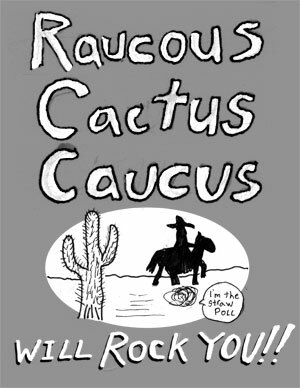 Raucous Cactus Caucus Will Rock You!! Click image for pdf — a prickly 6.7 mb! Nordeast Comics Summit & Mpls Conspiracy Jam this Thursday, Jan 5th! To kick off 2012 we’ll be hosting a series of Boot Camps to get you familiar with three digital tools that all cartoonists should know & love: Photoshop, InDesign, and Illustrator. For these Boot Camps we’re going to assume that you’ve never opened the programs before, so technology-phobes are encouraged to attend. Bring lots of questions because we’ll have lots of answers for you. How is Photoshop different than Illustrator? Photoshop is expensive — what are some alternatives? How do I scan stuff and bring it into Photoshop? How do I make a jpeg/gif/png? How do I color my comic after I’ve scanned it in?